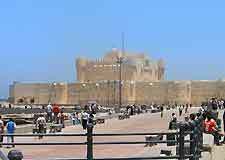 Alexandria is teeming with historical interest and ancient tourist attractions, particularly the ruins left over from the city's hey day under Roman rule, while more modern landmarks such as the Montazah Palace offer an insight into more recent eras. If you tire of touring ancient sites and monuments, the Corniche offers respite and the ideal setting to have a stroll. Numerous beaches and waterfront attractions stretch along the coast and ensure you can cool off in the Mediterranean, the perfect way to end a long day sightseeing. 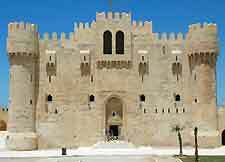 Set on an island that was connected to the mainland by Alexander the Great, the Qaitbey Fort is said to sit on the site of Ptolemy II's legendary lighthouse, built in 238 BC and one of the Seven Ancient Wonder of the World. The lighthouse fell in a 14th century earthquake, making way for the rather bleak, grey-stone fort, which was built using what remained of the lighthouse. The views over Alexandria from the fort are impressive. 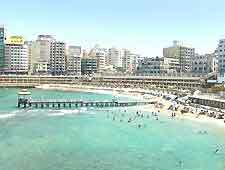 Aside from the historical riches of Alexandria, most people come here to enjoy the stunning Mediterranean beaches, which line the coast. With beaches stretching in either direction from downtown, visitors can choose to explore the coast at their leisure. Popular places to bathe and enjoy water sports include the exclusive eastern resorts of Agami or Hannoville, the upmarket Montazah Beach and the western vacation resorts of Ras el-Hikma, Sidi Barram and Sallum. One of the best places to watch the sun set over the Mediterranean Sea, the Corniche is a seaside promenade that stretches the length of the city and is constantly bustling with activity. The distinctly European feel and cosmopolitan character of the seafront allows visitors to feel at ease here. 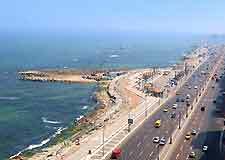 Attractions and sights that you can expect to encounter in this part of Alexandria include food and flower vendors, families strolling and couples simply enjoying the sunset and views. The fit can walk the 25-km / 16-mile length of the Corniche, while the less willing can take in as much or as little as they want. Fascinating 2nd-century AD funeral sculptures and friezes can be seen here in the eerie Kom el Shokafa Catacombs. Only discovered in 1900, the catacombs are the largest known Roman burial grounds in Egypt and three floors deep. 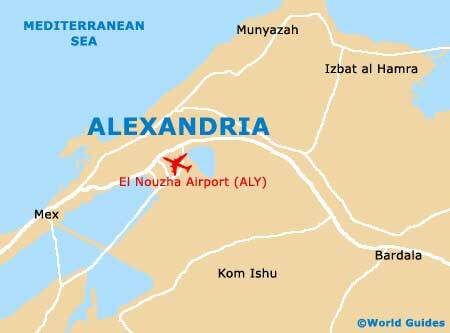 With hundreds of chambers, this is one of the most visited tourist attractions in Alexandria and visitors can walk around the tombs unsupervised.